The Centre for Research and Development (CRD) is now gearing itself to manufacture a 20-barrel multi-barrel rocket launcher (MBRL) in the wake of its experts successfully manufacturing a ten-barreled MBRL, CRD Director General Brigadier Dr. Thiran de Silva said. 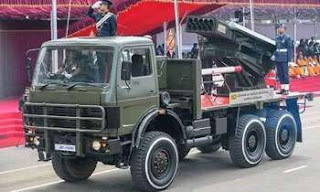 The multi-barrel rocket launcher (MBRL), manufactured by the CRD of the Ministry of Defence, was unveiled for the first time at the 71st Independence Day Parade on Monday. Brigadier de Silva said the 10-barrel rocket launcher has a maximum firing range of about 20 km. He said the shells used in the MBRL was also been manufactured by the CRD. “A CRD team comprising experts from the Sri Lanka Army, the local universities and Dr. Chandana Perera were able to manufacture the MBRL at a cost of Rs.7 million. The MBRL was manufactured according to international standards and can use shells or rounds used in the MBRLs made in China and Pakistan,” Brigadier de Silva said. He said the CRD had the capability to manufacture a 40-barrel MBRL at a cost of Rs.10 million but had initially focused on manufacturing the 20-barrel MBRL. “We will hand over our locally made MBRL to the Sri Lanka army for training after adjusting the firing range. We have to reduce the firing range to one km because the army cannot use a 20 km firing range for training purpose,” Brigadier de Silva said.